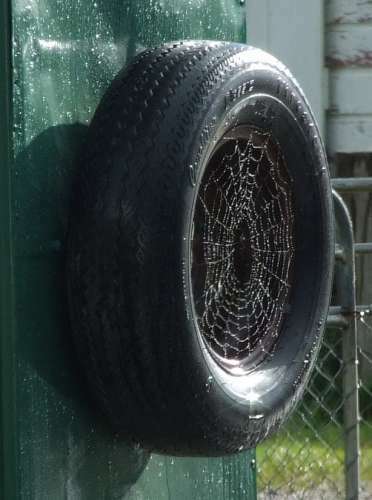 A cobweb in a wheel on a horse float, croped so web could be seen. Thank you all for looking in an comments. There had just been a shower of rain an the sun came out, so the sun shining on the rain drops. What a great photo! A spider web perfectly formed inside the tire. Great eye you have Kelly! Well caught Kelly looks pretty with the dew on it, or is it jst the light?